Causeway has a powerful, flexible voting tool. Conduct general polls to get your group's feedback on a specific topic, or conduct critical Board business by having committee members vote on an official ballot. Causeway can track meeting attendance in relation to voting requirements, meeting quorum, and voter eligibility to help manage a group's balloting needs. Those creating a ballot can schedule any number of automated reminder notifications, and can select whether the reminders should be sent to all eligible voters or only to individuals who have not yet voted. Proxy votes can be cast by designated administrators for individuals who may be traveling without internet access and still wish to voice their opinion. 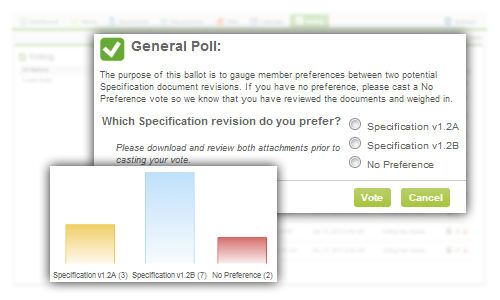 Voting results can be graphically displayed to users during voting, after voting has closed, or results can be kept private.